Provide comfort for the family of Roy Mott, Jr. with a meaningful gesture of sympathy. Roy LaVerne Mott, Jr. age 76 of Thomasville, AL died March 14, 2019 at Providence Hospital. He was born March 24, 1942 in Fulton, AL to Roy LaVerne and Annie Kate Mott. He was a loving husband, dedicated father, and loving grandfather. Mr. Mott enjoyed farming and gardening and was active in many community projects. He was a very active member of Bashi United Methodist Church where he served as chairman of the board. He served as Fire Chief for the Thomasville Volunteer Fire Department for 17 years from 1978 to 1993. Mr. Mott was a former President of the Alabama Association of Volunteer Fire Departments, former President of the Rural Community Fire Protection, and served as commissioner of Alabama Fire College. He helped organize many volunteer fire departments across the state, including the Fulton Volunteer Fire Department. 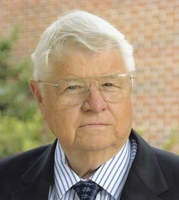 Mr. Mott also operated Mott Radio Service for 32 years in Thomasville, AL and retired from the Alabama Forestry Commission as Director of Communications. He was always busy and hardworking. He is survived by his wife, Sandra Hawk Mott; two sons, Morris Russell Mott (Holly) and Roy LaVerne Mott, III; brother, Vivian “Shine” Mott; and three grandchildren, Aubrey Kay Mott, William Russell Mott, and Shelby Noelle Mott. Visitation will be held at O’Bryant Chapel Funeral Home on Sunday, March 17, 2019 from 2:00 pm until the 3:00 pm service time with Rev. Jimmy DuFriend officiating. Burial will follow at Bashi United Methodist Church Cemetery. In lieu of flowers memorials may be made to: The Thomasville Volunteer Fire Department or The Fulton Volunteer Fire Department. Arrangements by O’Bryant Chapel Funeral Home. To send flowers in memory of Roy LaVerne Mott, Jr., please visit our Heartfelt Sympathies Store. Provide comfort for the family of Roy LaVerne Mott, Jr. by sending flowers. Sending our love and sincere sympathy to the entire Mott family. We pray for comfort during this time and the days ahead. We are thankful for the times we spent with our friends, Roy and Sandra. Sincerely, Ron and Sandra Glass, Cullman, AL. Heartfelt Sympathies Store purchased flowers for the family of Roy Mott, Jr..